New security measures announced in the 2018-19 Federal Budget include the deployment of body scanners at major and regional Australian airports. Although the Government’s press release omitted to indicate what sort of technology will be used, Fairfax media claim the scanners will use full-body X-ray computed tomography (CT) technology. Currently, body scanners are only located at Australian international airports. The full-body scanners at these terminals use non-ionising millimetre-wave technology. 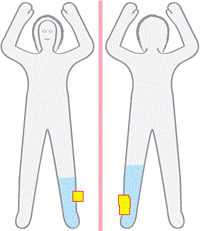 According to the Department of Infrastructure and Regional Development’s Millimetre-wave Body Scanner Health and Safety information sheet the penetration into the human body from the high frequency used in the millimetre-wave body scanner is “lower than from most other exposures encountered in daily life”. The Australian Radiation Protection and Nuclear Safety Agency (ARPANSA), in its infinite wisdom, claims that these scanners – which use extremely high frequency radiofrequency radiation in the gigahertz bands – do not pose a health risk to passengers or operators. ARPANSA is equally sanguine about full-body X-ray backscatter scanners, although this technology has lost favour elsewhere. No mention is made on its website of how it views CT full-body scanners. Selection of passengers at Australian international airports for current full-body scans is random. It is unknown whether this policy will be extended to domestic airports. Australian Business Traveller claims the new full-body scanners will replace the current metal detectors at many screening points. Unlike policy in countries such as the USA, where passengers can usually request a pat-down to avoid a full-body scanner, refusal to be scanned in Australia means you will not be allowed to pass through the security screening point or board your flight. Although it is unclear at this stage what sort of technology will be used to irradiate travellers, and under what circumstances, it is obvious that we will be subject to yet another source of radiation. This physician maintains that we do not know for sure that full-body scans are safe in instances of long-term chronic exposure. Although alternative screening processes are not normally available in Australia, the Department of Infrastructure and Regional Development’s TravelSECURE website states that an alternative is available for travellers with special needs. However, there is one catch: you must inform the security screening officer of your circumstances before you begin the screening process and be ready to provide supporting documentation. This entry was posted in Radiation and tagged ARPANSA, back-scatter scan, CT x-ray, Department of Infrastructure and Regional Development, full-body scanner, Health, millimetre-wave, Radio frequency. Bookmark the permalink. This can’t be for real. Surely, the Fairfax Media journalist got his wires crossed? Most probably it’s more millimetre-waves that the Government is planning to bombard us with. Also, I just looked into this and the reason they are doing this is because -http://www.abc.net.au/news/2018-05-30/khaled-merhi-cleared-after-weapon-found-to-be-fly-swat/9815708 – Which does not make sense – since he was found “not guilty”! So this whole thing is ridiculous and will end up costing tax payers more money! What an inconvenience to everyone! This is terrible and is a violation of human rights, I don’t want to be scanned at airports! My husband was one of the unlucky ones selected to undergo a full-body scan prior to our departure on a recent overseas holiday. A shame that I wasn’t the one selected – as I could have provided the letter from my doctor certifying that I have trouble with electrical hypersensitivity. I think you meant to say “public servants”…. Sorry, this was meant to be a reply to Juneeta’s comment. I can’t get a single doctor to be able to diagnose me with EHS. On my last trip from Europe, I got body scanned three times – once in London and twice in Cairns. The stupid thing about the Cairns security check was that it was only meant to be a stopover and I was supposed to take the same plane to my final destination. A security check just to get back on the same bloody plane! The only reason they did me twice was that they didn’t do it right the first time so they figured that they had not mutated my DNA enough until they did it a second time. I’m getting sick of the term “non-ionising” to describe this biologically harmful radiation. What does that even mean, when Singh & Lai showed decades ago that DNA damage occurred to human & animal cells with RF & microwave “non-ionising” frequencies? It’s like saying that cigarettes won’t give you syphilis, and therefore they are OK! This ridiculous “terrorist” threat and the incursions of freedom that they think it gives them an excuse for, is more of a danger to the Australian people than any supposed terrorists. Can somebody set up a web based response form to bombard all of the relevant pubic servants and puppetitians?